Novomatic transport you to a cartoon savannah with this slot game. In the African savannah, many of the world’s most recognisable animals can be found, including the Hippo! Hippos can grow to over a ton in weight! They are formidable animals and said to be one of the most dangerous on the planet. Adult hippos are aggressive and unpredictable and aren’t usually preyed upon by any other animal. Having said that, the hippo in this game is friendly and will become your new buddy for sure. This hippo is so good at getting wins, it will practically hypnotise you with its abilities. The Hypno Hippo can hypnotise the reels and all of the symbols, too! Hypno Hippo has a theoretical Return to Player percentage of 95% and that’s very typical of Novomatic games. You can play Hypno Hippo with up to 25 paylines. There are 15 positions in total, with 3 rows and 5 reels. The Hypno Hippo lives in the water in the African savannah and he is joined by some other African animals! Characteristic Novomatic music plays in the background and there is also the option to play in auto mode and to gamble payouts. 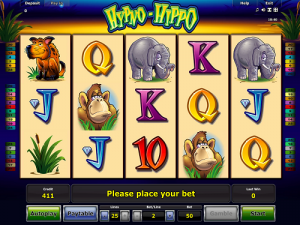 Hypno Hippo is similar to other Novomatic slots, such as: Summer Queen, African Simba, Monkey’s Millions and Rumble in the Jungle. The hippo doesn’t actually feature as a symbol in the game but its hypnotic eyes do! If you open up the paytable, you’ll be able to see the Hypno Hippo in all its glory, relaxing in the water. It’s yellow and green swirly eyes draw you in! On the reels, this hypnotic swirl features as the Wild symbol – which is actually pretty crazy to look at! This Wild symbol can stand in for any other symbol, apart from the card values. These card values include: 10, Jack, Queen, King and Ace. They give the smallest payouts, with payouts for 3, 4 and 5 matches. Other symbols that give bigger payouts for three or more matches are the hyena and the bulrush plant. The monkey symbol pays more and pays from two or more matches and the elephant pays out the most and pays from only one symbol! You can activate any number of the 25 paylines. All of the paylines pay from the leftmost reel towards the rightmost reel. The only odd symbol out is the Scatter symbol and that’s because the Scatter symbol is a chicken! This symbol doesn’t have to conform to paylines. It will pay from any position (as long as three or more land on the reels) and it can also be substituted by the Wild symbol. When the symbols land in winning positions and give you payouts, they will do a little wiggle for you! The best feature in Hypno Hippo is the Free Games feature. When three or more Wild symbols turn up on the reels in a single spin, the game will reward you with 8 free spins! Throughout these free spins, when the symbols get a win, they all become hypnotised by the hippo and start behaving like chickens! What’s more, the other animals can also substitute for the chicken symbol – which means you can get even more Scatter wins. Not having to line up the matching symbols on a payline (on consecutive reels) makes getting wins even easier – especially when there are lots of symbols that can act like other symbols. You’ll really be enjoying the big wins you can get when you trigger the Free Spins feature. Hypno Hippo has built-in gamble and autoplay features, too.